Spain win 4-2 on penalties. Fabregas hits winning spot-kick as holders squeeze through to final - kaycee Weezy! Cesc Fabregas sent Spain's into their third successive major final with the winning kick in a dramatic Euro 2012 semi-final penalty shoot-out in which Cristiano Ronaldo's gamble on taking Portugal's last spot-kick backfired. World and European champions Spain defeated their Iberian neighbours 4-2, with Joao Moutinho and Bruno Alves missing for the Portuguese. But with Ronaldo waiting to take the final penalty for Portugal, Fabregas’s shot, which went in off the post, made it 4-2 to Spain and denied the Real Madrid forward the chance to make an impact in the shoot-out. 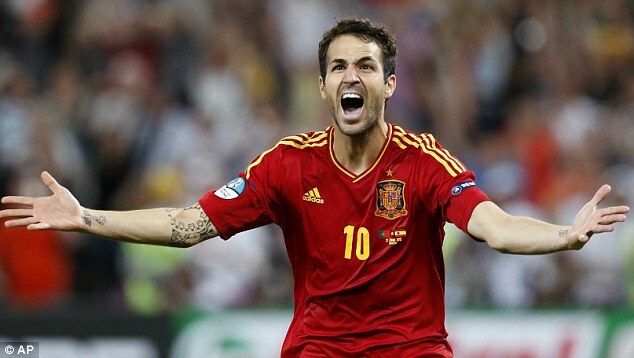 Having deployed Fabregas in the 'false nine’ role or Fernando Torres as the spearhead of Spain’s attack so far in this tournament, Vicente del Bosque sprung a surprise by naming the Sevilla forward Alvaro Negredo in his starting line-up for the first time at Euro 2012. With Portugal’s resolute defence proving to be the bedrock of their progression to the semi-finals alongside Ronaldo’s goals, the more physical presence of Negredo was intended to put pressure on the Portuguese centre-backs, Pepe and Bruno Alves. Negredo, who turned down a £12 million transfer from Real Madrid to Hull City three years ago — strange, but true — lacked the flair of Fabregas and the pace of Torres, but his selection had the desired effect with both of Spain’s early chances involving the 26 year-old. Just nine minutes into the game, Negredo created a clear chance for full-back Alvaro Arbeloa by laying off an Andrés Iniesta pass to the former Liverpool defender, who found himself with an unobstructed strike on goal from 20 yards. Instead of striking the ball, though, Arbeloa displayed the finishing of the defender that he is by sidefooting high over Rui Patricio’s crossbar. Some 12 minutes later, Negredo once again acted as the hub of Spain’s attacking forays by latching on to Xabi Alonso’s long pass before laying into Xavi, whose instant pass to Iniesta resulted in the Barcelona midfielder curling his effort over the bar. By that stage, Spain were having to overcome the crowd as well as their Iberian neighbours, who went into the game having never beaten the opposition outside of Portugal. For whatever reason, though, the majority of those inside the three-quarters full were backing Portugal and their unsporting whistling of Spain’s players whenever they began to pass the ball around the pitch was a strange development. The failure of Turkish referee Cuneyt Cakir to book Sergio Ramos for an early foul on Nani, when play was simply waved on, angered the Portuguese and appeared to win over the neutrals. Before the game, concern had been voiced in Portugal over the selection of Cakir due to Uefa’s referees’ committee being chaired by the president of the Spanish Football Federation and a Turkish vice-president, Senes Erzik. It smacked of Portuguese paranoia, the worst of Jose Mourinho’s 'us against the world’ mentality being aired by the Real Madrid manager’s fellow countrymen. Ronaldo, the man who struck fear into Spanish hearts, struggled to make an impression in the first half and it was the tenacity of midfielder Meireles and João Moutinho which caught the eye. Resilience and aggression tends not to be enough against Spain, however, and while Ronaldo remained quiet, Del Bosque’s team had the edge. The Spanish players, wearing black armbands as a tribute to the 23 year-old Real Betis defender Miki Roque, who last a battle against pelvic cancer at the weekend, simply lacked a finishing touch to round off their dominance of possession. Portugal’s readiness to hassle Spain began to frustrate Del Bosque’s team, however, and the fluency of their passing markedly diminished. Such was Spain’s inability to keep the ball early in the second half that Negredo was replaced by Fabregas in an attempt to regain the upper hand. Only Spain could take off their only forward and replace him with a midfielder while drawing 0-0, but the switch highlighted Del Bosque’s lack of faith in Torres, who remained rooted the bench. When David Silva was replaced by Jesus Navas on the hour, it was another blow to Torres’s status as the No 1 striker in the Spain squad. Portugal were able to capitalise on Spain’s uncertainty by creating a succession of chances, but none were good enough to trouble goalkeeper Iker Casillas. Hugo Almeida sent two left-foot strikes high and wide before Ronaldo was booked for complaining at Cakir’s refusal to give a penalty following a Ramos challenge on the hour mark. There was nothing wrong with the challenge and Ronaldo’s reaction merely highlighted his growing frustration at being unable to influence the game. But Spain’s match-winners were also having an off night and it was not until Xavi struck a 25-yard shot on 68 minutes that either goalkeeper had a shot to save. The game descended into a war of attrition, a series of cynical fouls by both sets of players, with Pepe kneeing Real team-mate Xabi Alonso in the back and Alves flooring Fabregas with a crude challenge from behind. Nani was also on the receiving end from Sergio Ramos, but Portugal’s best chance came courtesy of a free-kick awarded following the merest brush by Arbeloa on Ronaldo. He sent it narrowly over the bar, however, and he repeated his near miss from another free-kick on 85 minutes. Then came his skewed left-foot strike from 12 yards which denied the game a winner within 90 minutes. As penalties loomed, Spain upped the ante. Iniesta was denied by Rui Patricio and Ramos sent a free-kick wide, but d it had to be settled on penalties.